Our penultimate conference recap will focus on the Sun Belt, a conference that saw half of its members become bowl eligible last season. To see last year's post on the Sun Belt, click here. First here are the 2012 Sun Belt standings. 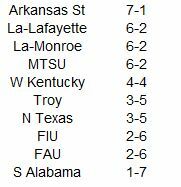 And here are the 2012 Sun Belt SDPI standings. The standings are sorted by SDPI with ranking for each category (out of 10 teams) in parentheses. Despite breaking in a new coach for the second-consecutive year, Arkansas State repeated as league champs. On the whole, the league sent four teams to postseason play for the first time ever. Troy finished in the upper-half of the conference on both sides of the ball, but missed out on a bowl game for the second year in a row thanks to a 2-4 record in one-score league games. Overall, the Trojans were just 2-6 in one-score games, losing tight contests to both Mississippi State and Tennessee of the SEC. In addition, six of their seven losses came to teams that qualified for bowl games. 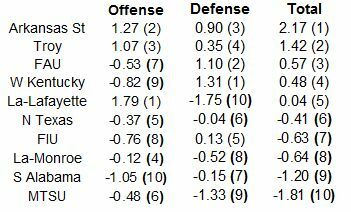 Middle Tennessee State was below average on both sides of the ball and was actually the lowest rated Sun Belt team by SDPI in 2012. Yet they won three quarters of their conference games thanks to an in-conference best +10 turnover margin and a sterling 4-0 record in one-score games. In fact, over the course of eight Sun Belt games, the Blue Raiders were actually outscored by eight points despite their strong record. In two seasons at the helm, Mark Hudspeth has guided the Cajuns to 18 wins, including a pair of bowl triumphs, and has made them into one of the most explosive mid-major offenses. Lafayette topped 400 yards of offense in six of their eight conference games. After a 5-1 start that included a win over in-state rival Kentucky, the Hilltoppers limped to the finish with just two wins the rest of the season. However, the defense, outside of a ghastly performance against Louisiana-Lafayette, remained stout, holding seven of eight league foes under 400 yards of offense. The Cajuns certainly played an entertaining brand of football in 2012. Half of their league opponents gained over 500 yards against them and the average score of their Sun Belt games 37-28. 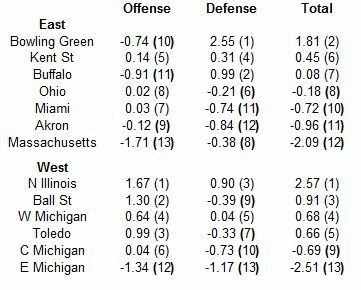 Last post I examined the great success the MAC had in their non-conference clashes with teams from BCS conferences in 2012. This week, I want to do the same with the Sun Belt. In 2012, Sun Belt teams won three games versus teams from BCS conferences. That number equals the three they notched in 2007 as the most the league has won in its history. In addition, the winning percentage against BCS conferences was the best in league history. The table below lists the aggregate winning percentage of the Sun Belt against BCS conference opponents for each season since 2005. The Sun Belt will be posting a net loss of two members in 2013, as Florida Atlantic, Florida International, Middle Tennessee, and North Texas move up to Conference USA and Georgia State (from IAA) and Texas State (from the WAC) join the league. However, the conference's stronger teams, Arkansas State, the Louisiana schools, Troy, and Western Kentucky remain in tow and could add additional BCS conference wins to the Sun Belt's ledger. Just three more conferences to go. This week we head to the nation's heartland where we examine the 2012 MAC season. Here's a link to last year's MAC post. 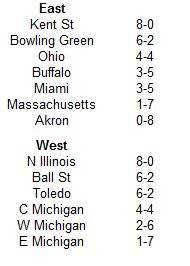 First here are the 2012 MAC standings. And here are the 2012 MAC SDPI standings. The standings are sorted by division by total SDPI with ranking for each category (out of 13 teams) in parentheses. If you enjoyed lame puns, you could call 2012 'The Return of the MAC'. The league sent an amazing seven teams to bowl games, had four teams visit the AP top 25, and had its first BCS bowl participant. 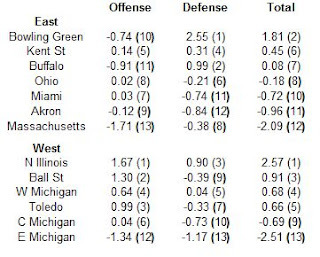 The Western Michigan Broncos lost three conference games by less than a touchdown and committed 22 turnovers leading to an in-conference worst -12 turnover margin. These factors prevented the Broncos from being one of the league's Magnificent Seven bowl teams despite solid peripherals. That got the head coach fired despite four winning campaigns and three bowl appearances in eight seasons. Kent State played in their first bowl game since being captained by The Dawgfather in 1972. 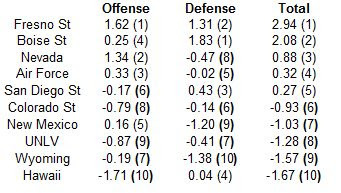 The Golden Flashes were perfect in conference play (until the MAC Championship Game), but they only ranked sixth in SDPI. The Golden Flashes won the two close conference games they played, had a +9 in-conference turnover margin, and scored five non-offensive touchdowns to power their special season. Jordan Lynch did a fine Chandler Harnish impression, throwing for over 3000 yards and adding over 1800 on the ground. The team gained over 400 yards in each conference game, and twice topped the 600 yard mark. The Minutemen began their first season in the MAC by gaining nearly 1000 yards in their first two games, but averaged just 252 yards per game in their final six. The Falcons boasted one of the stouter mid-major defenses in the country, and perhaps the best the MAC has ever seen. The Falcons held three league foes under 200 yards of offense, and five under 300. Unlike the Falcons, the Eagles were a sieve on defense, holding just one conference opponent under 400 yards of offense. In 2012, MAC teams won eight games against teams from BCS conferences. Some of the wins were not all that impressive (league champ Northern Illinois held off a bad Kansas team by just a touchdown at home), but when looking at how the league had performed against big-boy conference foes in the past few seasons, the record was impressive nonetheless. After winning just nine such games in three season, the MAC nearly equaled that total in 2012, and their winning percentage against BCS conference teams was nearly triple what it had been the previous three seasons. The next installment in our 2012 lookback takes us to the Mountain West Conference. The league said goodbye to a traditional power TCU, but welcomed in three teams from the WAC (Fresno State, Hawaii, and Nevada). In 2013, the league will welcome two more WAC schools (San Jose State and Utah State) and play a conference championship game. Here is a link to last year's Mountain West post. 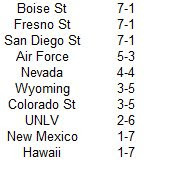 First here are the 2012 Mountain West standings. And here are the 2012 Mountain West SDPI standings. The standings are sorted by total SDPI with ranking for each category (out of 10 teams) in parentheses. We had a three-way tie at the top of the heap with a rock/paper/scissors situation as Boise beat Fresno, who beat San Diego State, who beat Boise. Nevada was statistically the third best team in the conference, but only managed a .500 mark in league play. The Wolfpack were not extermely unlucky either, posting a 3-2 mark in one-score conference games. We'll just have to chalk this one up to the vagaries of an eight-game conference season and a very poor defense. This one is pretty easy to answer. San Diego State enjoyed a solid season, ranking fifth in the conference in SDPI. However, teams of their ilk usually do not lose just once in conference play. The Aztecs won both of their close conference games, using a two-point conversion to stun Nevada in overtime, and a kickoff return touchdown to upset Boise on the Smurf Turf. These guys were fun to watch (until the bowl game of course). Quarterback Derek Carr threw 37 touchdown passes and now has more in his Fresno career than big brother David. Running back Robbie Rouse had nearly 1500 yards on the ground and matriculates as the school's all-time leading rusher. Freshman receiver Davante Adams hauled in over 100 passes and caught 14 touchdowns. Norm Chow continues to tarnish his reputation as an offensive guru by leading teams like this. The Warriors failed to top 400 yards of offense in any conference game. Despite a host of attrition, the Broncos boasted the best defense in the league. At one point, they held five consecutive league foes below 300 yards of offense. The Cowboys surrendered yards in bunches, allowing half their league foes to gain at least 500 yards of offense. Last post, I examined the strong homefield advantage June Jones has built at SMU. This week I want to look at what he left behind on the islands. Jones coached the Warriors for nine seasons (1999-2007), and during that time, his teams went a stellar 28-9 against league foes at home and in his final six seasons, that mark was 21-3. Since Jones left following the 2007 season, the Warriors have still won more than they have lost in their exotic locale. but their home record against league foes is a more pedestrian 11-8. See the table below for the full rundown.